Allgas Heating, Bathrooms and Plumbing is the leading bathroom, heating and plumbing contractor in Dublin. With almost 30 years’ experience in the business, we are experts in what we do. Our mission is to meet all our customers’ bathroom, heating, plumbing, home maintenance and improvement needs with professionalism, quality and courtesy. We pride ourselves on the level of service we provide. Our before, during and after work service is unrivalled. The Company was created in 1987 by two experienced and qualified Dublin Gas technical experts, Thomas Mahady and Bernard Leech. We have since then built up our quality gas installation, repair and maintenance, oil boiler installation as well as bathroom and plumbing business throughout the Greater Dublin area. We now have a team of 5 fully qualified RGII installers. We have over 4,000 satisfied customers. The reason our business has grown is the number of repeat customers and referrals from satisfied customers. Personal service to our customers is very important to us. We are a company that is large enough to provide excellence and reliability but small enough to build personal relationships with each and every one of our customers. We specialise in bathroom design and installation, gas boiler replacement, full heating systems, new boilers, boiler repair, boiler service, all plumbing services and indeed all the technical services you would need in your home. This means that whatever your requirements we can advise you on the best solution for you and your home. We will listen to your needs and requirements, technically survey your existing system, explain any technical issues and give you a written quotation with all your options. When we come out to discuss your requirements you will see the difference in dealing with our experienced technical staff as opposed to just a salesman. Our heating installation and repair fitters are experts in all types of boilers and every aspect of heating systems, system controls, energy efficiency etc. Unlike our competitors we work on all aspects of your central heating system, whether you need a new time-clock, a new radiator, a radiator bled, a new boiler or a complete new system. We offer a free energy audit with our gas boiler servicing so we can help you save money on your heating bills. Our bathroom design and installation service will ensure you get the bathroom you have always wanted. Our bathroom service is a complete service including all aspects such as design, tiling, plastering, electrics etc. as well as plumbing of all sanitary ware. We can carry out any of the small plumbing repairs you need such as leaky kitchen tap, toilet not filling etc. We also offer a complete home service so that if you want carpentry, painting, plastering, electrical work, building work, roofing, tiling etc. in any part of your home, we have a team of professional tradespersons. So whether it is a bathroom, a gas or oil boiler, a solar panel or just a new tank in the attic we will meet your needs. Allgas Heating, Bathrooms & Plumbing is a registered Contractor under the Home Renovation Incentive Scheme (tax credit from Revenue Commissioners) and the Better Energy Homes Scheme (SEAI). We have a current tax clearance certificate. Allgas Heating, Bathrooms & Plumbing also meet all the requirements for grants for the elderly and disabled from Dublin City Council, Fingal Council, South Dublin County Council and Dun Laoghaire Rathdown Council. For more information see tax credits and grants. 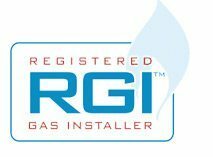 Allgas Heating, Bathrooms & Plumbing is a RGII Registered Gas Installer. All our staff are RGII registered. All of our installations conform to Irish Standard 813 “Domestic Gas Installations”. We comply with all health and safety legislation and our own Safety Statement is strictly adhered to. to ensure quick response and full coverage of the greater Dublin area. We have public liability insurance coverage of €6.5m. 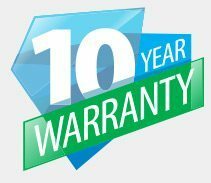 Our gas boilers come with up to a 10 year guarantee. This means that you can have peace of mind with a boiler installed by Allgas Heating, Bathrooms and Plumbing. With our team of 5 RGII installers we can provide fast efficient back up. All our plumbers and are fully registered RGII domestic gas installers. They have all started their careers with us and most have been with us for a significant number of years. Unlike our competitors, the company’s policy is to train its own apprentices – in conjunction with Solas. This ensures that all our employees are trained to the highest technical and professional standards. All our RGII registered installers have at least GID (Gas Installer Domestic) Certification. We also send our employees on regular boiler manufacturer training courses to ensure that their knowledge base on boilers and heating technology is continuously kept up to date. We also believe in investing in the future and currently have three apprentices in training. We know that our staff are our greatest asset and highly value each of them. Let us introduce our team. We are well aware that our customers are our business and we value each and every customer. This is the ethos of our company and is reflected by our staff in our dealings with each customer. Customer feedback is strongly encouraged and shared with all our team. We would hope that once we carry out a job for you e.g. service your boiler, we would be your first port of call whether to fix a leaky tap, get your attic insulated or convert a bedroom into a bathroom. Indeed many of our customers have been with us since we started in 1987. We regularly do work for the now grown up children of our older customers. From a kitchen tap to a complete refurbishment of a house, no job is too big or too small. 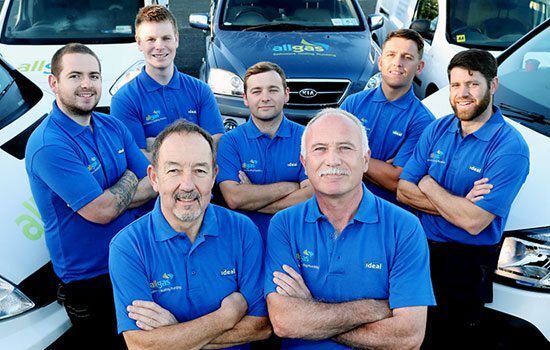 We in Allgas Heating, Bathrooms & Plumbing pride ourselves on treating each job and each customer as our priority whether we are just carrying out a boiler service, installing an attic tank or completely revamping the heating, bathroom or kitchen in your home. If I was to sum up Allgas it would be “friendliness and professionalism”. They originally put in my gas central heating in my first house 12 years ago and came every year since to service it. They have since done the same job in my new house and refurbished my bathroom there. I wouldn’t use anyone else.